If you have 2000 Life Points or less, you can Special Summon this card (from your hand). When this card is Normal or Special Summoned: This card's ATK becomes half the opponent's Life Points. 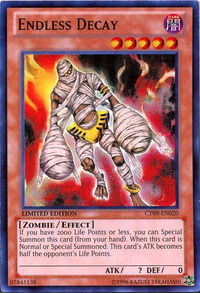 This card is similar to a Closer from the Konami survival horror series Silent Hill. The monster is wearing a golden anklet on its left ankle. Ironically, in Ancient Egypt, it was common for women to wear anklets, not men, as depicted in the artwork. Also, its wearing some sort of golden waist robe, indicating that it once was a wealthy pharaoh. If during "Endless Decay"s Special Summon the Life Points become 2001 or more, "Endless Decay" is still Special Summoned. Example: If during "Endless Decay"s Special Summon the effect of "Royal Oppression" is activated and "Gift Card" is chained to increase the Life Points of the player that Special Summons "Endless Decay" to 2001 or more, "Endless Decay" is still Special Summoned. : If during "Endless Decay" Special Summon the Life Points become 2001 or more, is "Endless Decay" still Special Summoned?